North American duck talk about the types of ducks that inhabit our lakes and ponds often begins with a resuscitation of facts. First and foremost, ducks have been an integral part of the game birds group in the United States. Duck hunting remains as popular a past time as photographing ducks. Duck identification equally interests both the hunter and photographer. The American Birding Association’s check list recognizes sixty three different types of ducks, geese and swan species (Anatidae family). 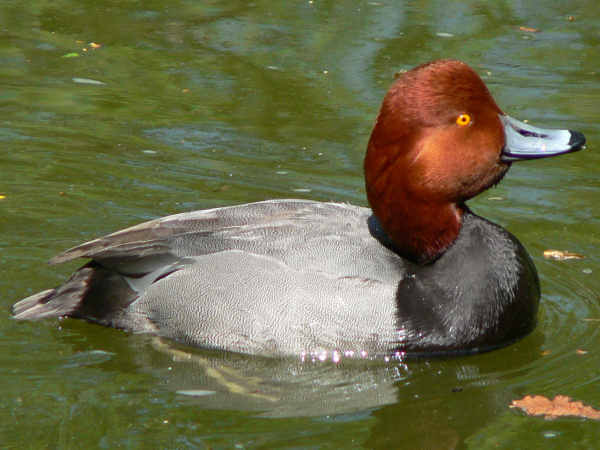 Forty six of those species fall into the general duck category, with duck species arranged into seventeen genera. The number of species/genera varies greatly, from the Wood Duck’s (Aix sponsa) singular representation of the Aix genus to the sixteen Anas species, often collectively called the dabbling ducks. No introduction to North American duck talk would be complete without mention of their vocal patterns. They tend to quack, squeak and whistle their way through the day. 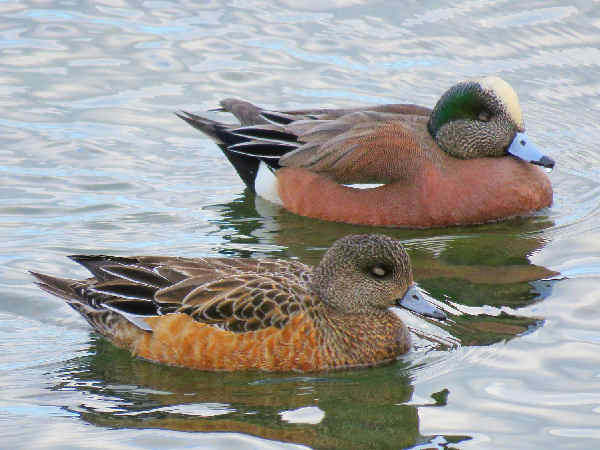 Here’s a guide to help with basic duck identification questions. 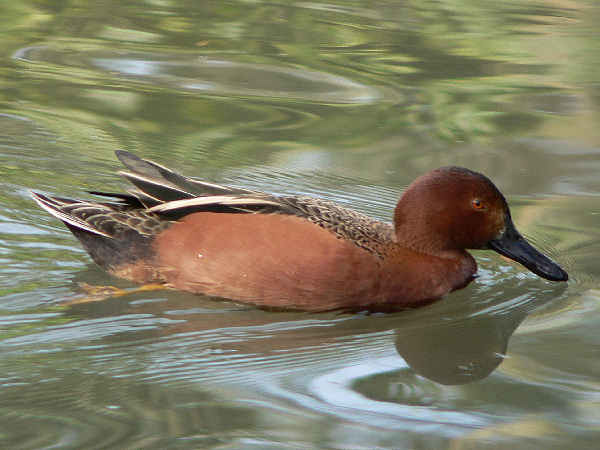 The sixteen Anas species makes them the most diverse of the North American ducks. Taking into account that only eleven Anas species count as native breeding species does little to put a dent into the genera’s relative diversity. 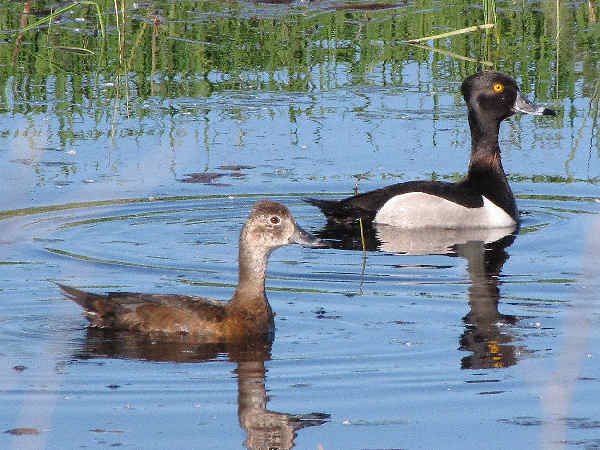 Only the seven diving ducks of the Aythya genus come close to matching Anas diversity. Perhaps the best known of the Anas, the green headed Mallards (Anas platyrhynchos) inhabit ponds and lakes from coast to coast. During non-breeding season, males and females share most physical characteristics. Foot color helps differentiate them, with males usually possessing brighter orange webbed feet as highlighted in the top picture. 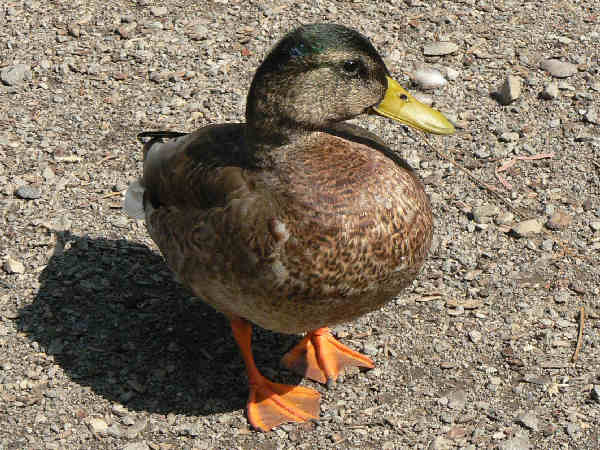 Hardy ducks, they often breed with other species, especially domestic ducks. Many mallards live year round in one territory. Others migrate to Canada during breeding season and winter in the United States. 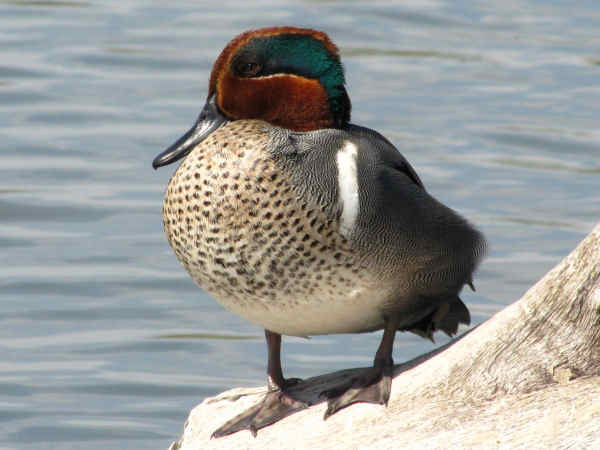 The picture at the top of the page shows a male Green Winged Teal. 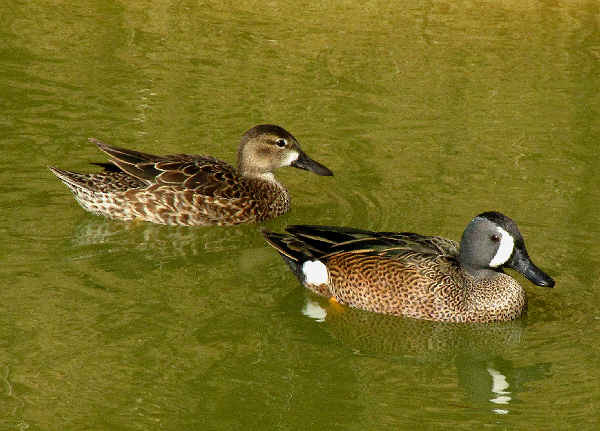 Here’s the Blue-winged Teal. 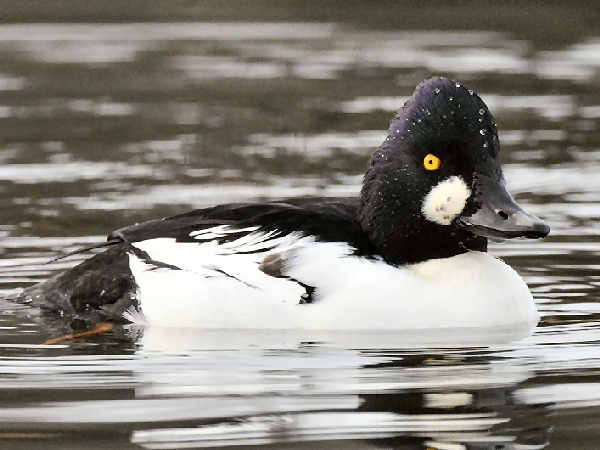 Second in diversity only to the Anas ducks, North America’s seven Aythya species, commonly called diving ducks, inhabit fresh water locations from coast to coast. Diving ducks share a similar physiological characteristic. 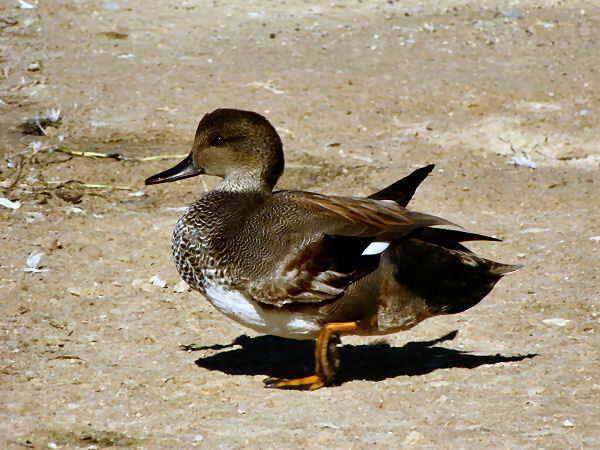 Compared to dabbling ducks, their legs and feet are situated further back on the body. Having the legs situated this way helps them with their propulsion while they are in the water. It also makes it awkward for them to walk on land, consequently you rarely see them walking. Leg structure also makes it easy to identify diving ducks at a distance. They need a running start on the water in order to lift off for flight. Their large webbed feet help them with that task. Dabbling ducks can take flight almost instantly. The common name sea ducks may be a bit misleading. Collectively the fifteen documented North American sea ducks tend to inhabit salt water habitats. 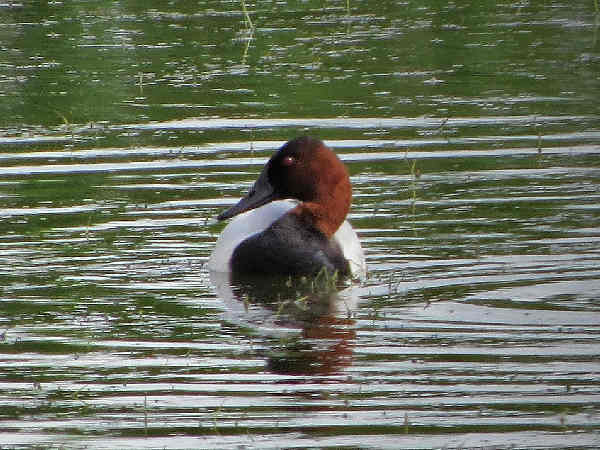 On the other hand, some individual species, such as the Mergansers, also spend time in fresh water lakes and rivers. They also belong to the the diving ducks general group. 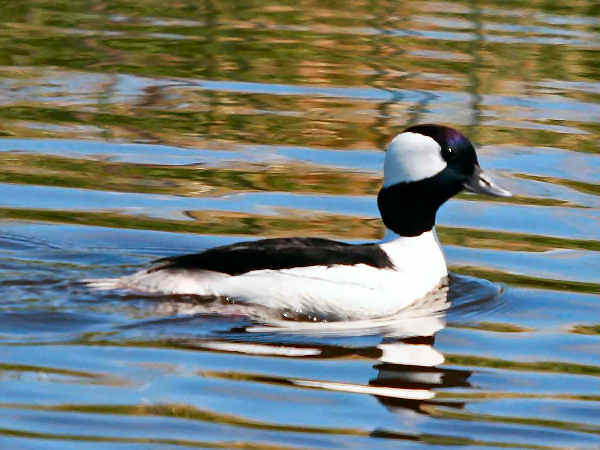 Most of the group refers to the Arctic diving ducks found along the Alaska and New England coasts such as Eiders and Scoters. Because they are migratory birds, the United States and Canada manage them under the terms of the 1986 North American Waterfowl Management Plan As a group, sea ducks tend to split their time between Canada and the northern United States, making them some of the least known duck species. 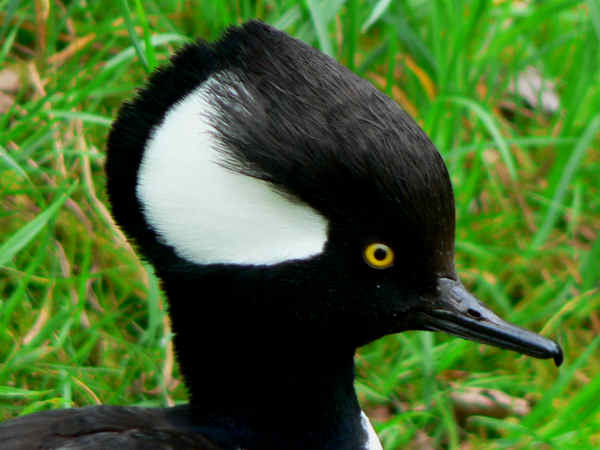 The picture shows a male Hooded Merganser. Two native stiff-tailed duck species share North American territory. The more wide ranging Ruddy duck (Oxyura jamaicensis) inhabits Western fresh water lakes and ponds year round. They winter along the Atlantic Coast. One look at the female in the top pictures explains the nick-name. They swim tail up. 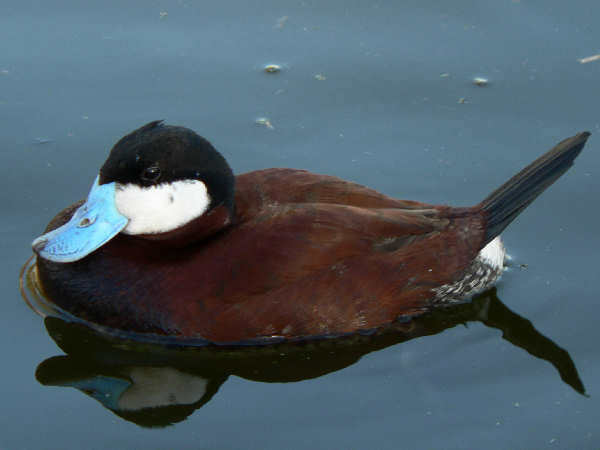 The bill of the male Ruddy Duck turns blue during the breeding season. 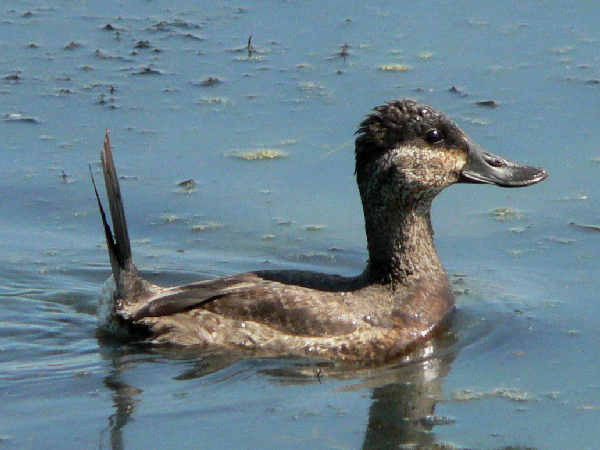 The Masked Duck (Nomonyx dominicus), a normally tropical species, resembles the Ruddy Duck. Males have a blue bill during breeding season and a large black patch on the face accounts for the common name, masked. Their presence in the United States changes from year to year. When they do migrate irregularly for breeding, they inhabits warmer areas of the country such as southern Florida and Texas. Biologically, whistling ducks are closer to swans and geese than they are to ducks. Because names count for something, birding enthusiasts often place them with the ducks. The American Ornithological Union places them in their own subfamily, Dendrocygninae. 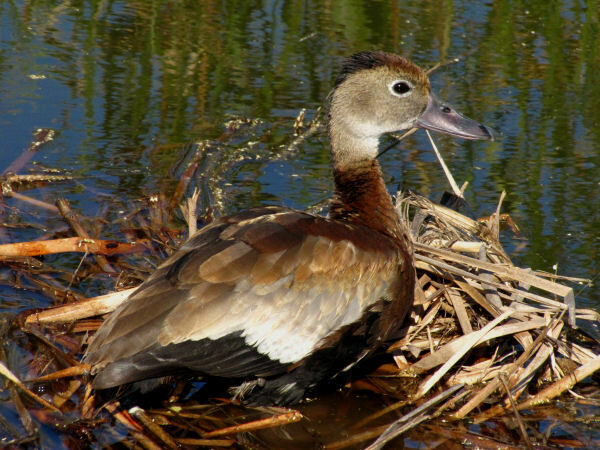 Whistling Ducks get their name from the whistling sounds they make. Generally quacking gets associated with duck vocalization. 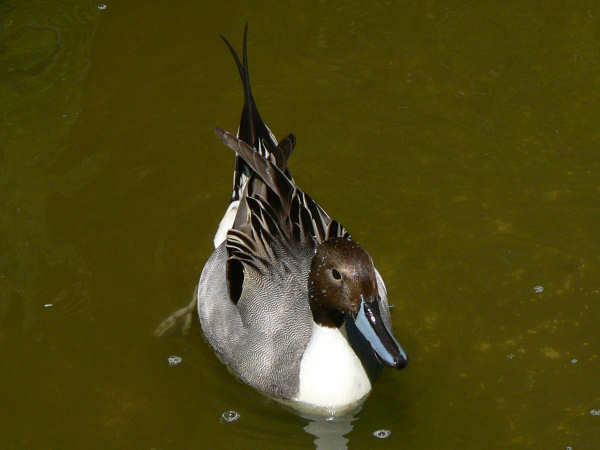 However some duck species evolved with alternative vocalization habits. The picture shows the Black-bellied Whistling-Duck (Dendrocygna autumnalis). Males and females look similar. In addition to the identifying white eye-ring and black belly, the duck also stands almost straight up. They are found primarily along the southern coast of Texas during breeding season. They are omnivores, eating seeds, plants, insects and other things in their territory. Colorful feathers make the wood duck (Aix sponsa) one of the North America’s most popular birds. Once called a perching duck because of its tree nesting activity, wood ducks defy a common classification, and represent the Aix genus in North America. 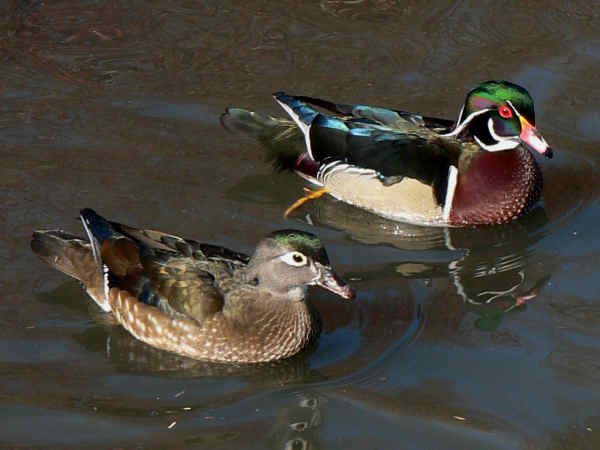 The picture shows a female and male wood duck. The white eye patch is characteristic of the female in the front. Males are much more colorful from the tip of the beak to the end of the tail. 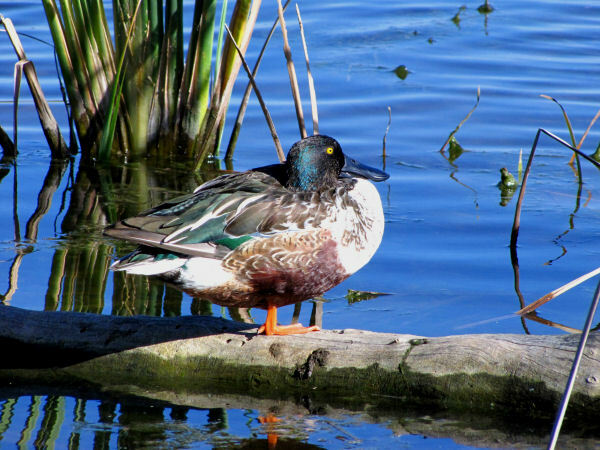 The male’s green, purple, black and white head feathers turn to a more uniform black color during non-breeding season. Wood Ducks inhabit a variety of fresh water and wetland areas throughout the United States, with breeding occurring during early or late spring, depending on their geographic location. Warmer weather in their southern habitats means an earlier start to the breeding season. Like Bufflehead ducks, Wood Ducks are one of the few duck species to breed in trees and nest boxes. In fact, Wood Duck populations in the United States have been, at the very least, adequately managed for almost a century because people continue to participate in placing nest boxes in their yards or parks. Popular games birds, wood ducks exhibit a bit of shyness around human populations.